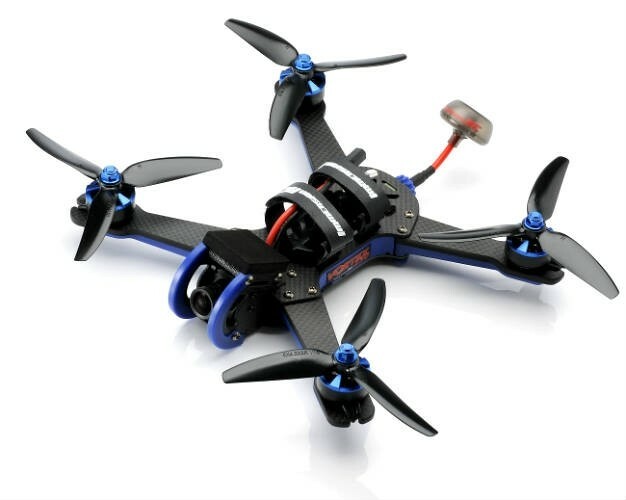 The ImmersionRC Vortex Mojo 230 is a crossover racing quad that allows you to either race or fly freestyle. The Vortex Mojo 230 has plenty of power, speed and maneuverability making it an excellent choice on the track or for freestyling. 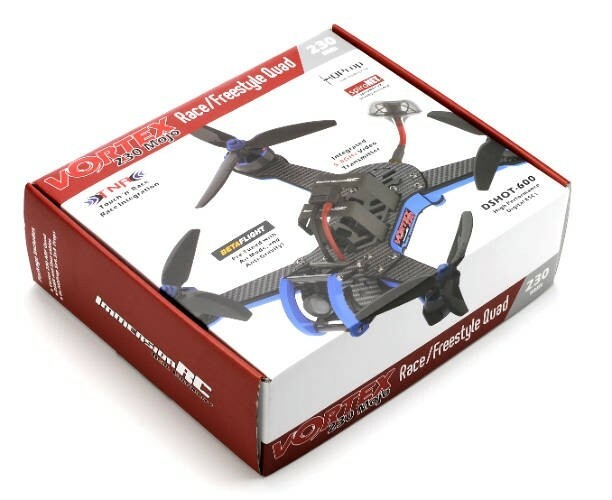 With quick setup from the box you will be able to install your radio receiver, mount the props and plug in your battery and flying in less than 10 minutes. 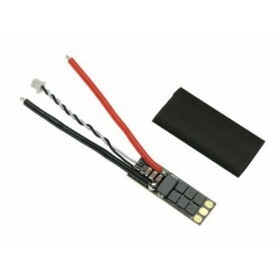 The ImmersionRC Vortex Mojo 230 is an international product which can have its video transmitter power set by the end user to match local laws from as low as a few Mw to 600mw. Please check with your local laws on which video power you should use. 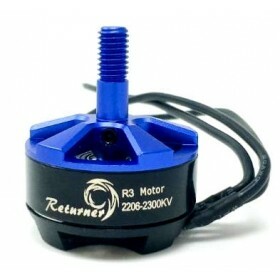 With the center of gravity at the same level as the propellers, the ImmersionRC Vortex 230 Mojo has a low moment of inertia thanks to the centralized mass. 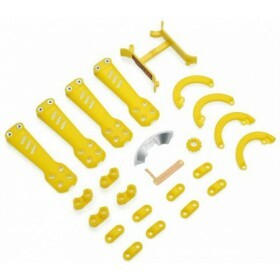 This allows the F3 flight controller maximum authority over the Mojo 230 to give crisp sharp stops or smooth rolls. Featuring pro-tunes which have been fine-tuned by none other than Chad Nowak / FinalGlide Aus and Travis Samson / GAPiT you can fly their systems and their setings right out of the box. The Vortex 230 Mojo will rival any modern day top mount freestyle quad, there is a huge performance boost over the Vortex 250 Pro, the 230 Mojo is running the BortherHobby Returner R3 2206 motors from the box, these motors are over 50% more powerful and with a weight savings of close to 100 grams it's easy to see why the Vortex 230 Mojo can rival any modern day top mount freestyle quad with less weight and more power being a winning combination. The new ImmersionRC ‘Synergy’ flight controller integrates with a full-graphic OSD and an on-board video transmitter based on the new Tramp HV design, with NFC support, including full Wand and Android App compatibility. The twin F3 processors ensure an 8kHz loop time and full support of BetaFlight 3.x. hence crispy smoothness is guaranteed as is full support for future upgrades such as BF 3.2 (which will be available as soon as 3.2 is released). Factory calibrated power levels from 1mW -> 600mW, glitch-free channel changing, and a micro-power pit-mode ensure that the ImmersionRC Vortex 230 Mojo will receive a warm welcome at any race event. The Synergy is a mere 6.5 grams, and is conformally coated to protect against the occasional accidental swim or unexpected downpour while out flying. Liftoff is the ImmersionRC’s FPV Racing simulator which is used by many pilots to develop their skills without breaking a single prop. Since its introduction the simulator has steadily increased it’s features, it now includs all of the Vortex airframes, many race environments (including the famous Dubai World Drone Prix circuit), and recently a fantastic multi-player mode. You can race against other pilots in multiplayer mode, create tracks with the track builder and download tracks built by the community. The ImmersionRC Vortex 230 Mojo will soon join it’s brothers in this simulator to allow you to practice come rain or shine. Fully integrated is the best Vtx in the business – ImmersionRC’s Tramp HV, which is the Tx that race organizers worldwide demand. Support for all standard FPV channels and power levels, from sub-1mW to >600mW, with Dynamic Power Control which allows pre-take-off power level to drop to sub-1mW while waiting on the starting grid, saving precious battery power, and keeping temperatures low. After landing the power level is also dropped to a minimum to preserve battery life and prevent heat buildup, important during a search to help with localization using a directional antenna. This is a bit of ImmersionRC magic. Change video transmission frequency without powering up the quad. So no stomping on someone else’s channel. Arrive at your local park (or that secret bando) and set video frequency, and transmitter power, with a wave of the magic wand (the TNR Mini Wand) or the Android App. No DIP switches, no buttons, no confusing blinky LEDs, and no scripts to run on your Taranis. We couldn’t have made it much simpler. 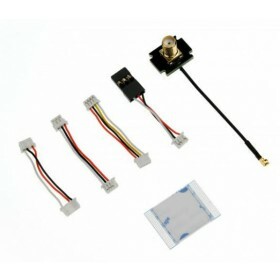 Another first in the FPV world, ImmersionRC has teamed up with Horizon Hobbies to integrate video transmitter control into certain Spektrum(tm) radios. Quads using this feature power up safely in pit-mode, and after finding a free channel on the video goggles, the menu on the Spektrum radio may be used to select frequency band, channel, and power level. A set of RGB LEDs sit on the tail of the Vortex 230 Mojo shine through a light-pipe diffuser, ensuring visibility from a wide angle. Since Airgonay’s now-famous ‘Star Wars’ video, rear lights on mini-quads have become not a ‘nice to have’, but a ‘no fun without them. The TPU camera mount for the Mojo is injected, no 3d printed parts here. Designed for the popular GoPro Session, or similarly sized cameras, the mount ensures that your precious camera survives the occasional knock, and also keeps your video clean, and free of vibration while recording your latest near miss or power run. The ImmersionRC Vortex 230 Mojo has custom 32bit 30A ESCs supporting all of the common standards and will provide regenerative braking, for crisp-responsive flight using BetaFlight. A 32bit ARM processor runs each ESC, ensuring plenty of processing power to drive even the most fussy brushless motors. Of course no ImmersionRC ESC would be complete without the innovative rotorSENSE, which programs prop direction with the flick of a finger. No more swapping motor wires! An on-board full-graphic OSD provides in-flight updates of critical parameters and sports a menu which allows all options to be programmed in the field using the R/C Tx and a set of goggles, or, alternatively, an LCD screen. A real-time interface with the flight controller enables artificial horizons, F-18 HUD style displays and exchange of critical flight parameters. Automatic warnings for battery capacity, voltage, and remaining flight time keep the pilot updated before batteries are exhausted. With a classical EzOSD-type layout, with all critical parameters available on-screen, A Heads-Up display which would be more at home in a fighter-jet, with artificial horizon and altitude indicator or a Race layout, with just the critical parameters, tucked around the edges of the display you can select the best ODS for you. All OSD layouts include screen-center alerts for critical warnings, such as battery voltage, EzUHF Link Critical, etc.